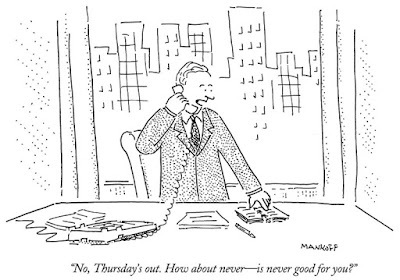 Bob Mankoff has been contributing cartoons to The New Yorker ever since 1977 and now, as cartoon editor, he evaluates more than 500 cartoons submitted to the magazine each week. Mankoff is proud of the many cartoons that have been published under his aegis. "Sometimes I take my aegis out of my drawer just to admire it," he writes. 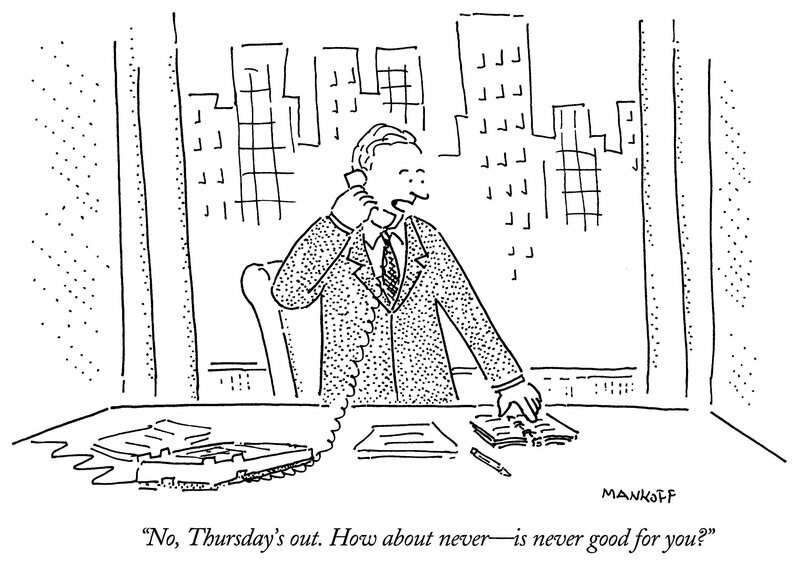 His most well-known cartoon shows an executive looking at his desk calendar, saying to someone on the phone: "No, Thursday's out. How about never — is never good for you?" The idea came to him during a phone call with a "friend" who couldn't seem to find the time to get together, Mankoff tells Fresh Air's Terry Gross. "I kept saying, Could we do it this time? Could we do it that time? And then I got exasperated with him and said, 'How about never? Is never good for you?' So, it was really a snotty line." publicadas por Carmelo Ruiz a la/s 8:24 a.m.